The Pokhara temple dedicated to the worship of Bhima, featured in our last segment, is situated in an ancient city along the Annapurna range of the Himalayas. Pictured above is Phewa Lake in Pokhara, with a backdrop of three famous Himalaya peaks. Our series, 'Nepal in the Mahabharata Period', wouldn't be complete without a discussion of the Himalayan mountain range named after it -- the Mahabharata Range. Also known as the Lesser Himalaya, the Mahabharata Range is a major east-west range with elevations from 5,000 to 9,000 feet (1,500 to 2,700 meters) along the crest. The Mahabharatas parallel the much higher Great Himalaya range, which runs from the Indus River in Pakistan across northern India, Nepal, Sikkim and Bhutan. From Eastern Bhutan, the two ranges become increasingly difficult to differentiate from one another as they approach the Brahmaputra River. The Mahabharata Range also parallels the lower Shivalik or Churia Range (Outer Himalaya) to the south. The southern slopes of the Mahabharata Range are steep and nearly uninhabited, while the crest and northern slopes rise gently enough to support upland pastures and terraced fields. 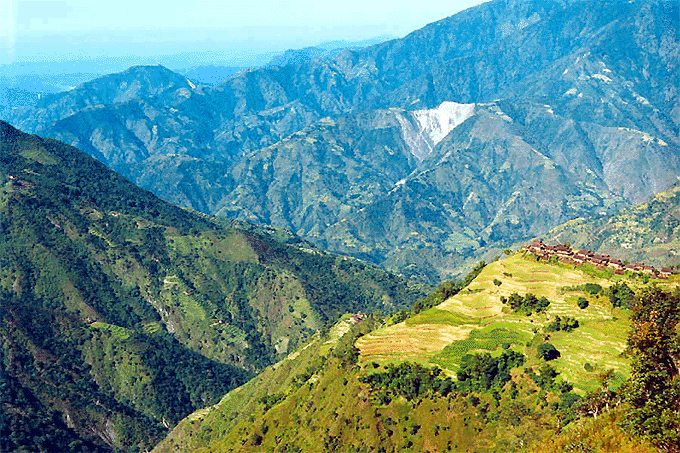 Nepal's densely populated Middle Hills begin along the crest, extending north through lower valleys and other "hills". Eventually the population thins out above 2,000 meters, at which point grain-based agriculture begins to give way to seasonal herding and cold-tolerant crops such as potatoes. Most ethnic groups found along the Mahabharata Range and northward into the Middle Hills have Tibeto-Burman affinities, including peoples of Nepalese origin like the Newar, Magar, Gurung, Tamang, Rai and Limbu. However, the largest ethnic demographic is comprised of the Indo-European Hindus known as the Paharis, who are mostly upper Brahman and Kshatriya or Chhetri castes. The lower terrain, south of the escarpment, was historically known to be malarial, and was only inhabited by indigenous peoples with evolved immunity, notably the Tharu tribe. Due to the daunting geophysical challenges to travelers, the Mahabharata range virtually isolates the population of southern Mahabharata from the rest of the local Kabhre Palanchok district. The Mahabharata Range is an important hydrographic barrier crossed by relatively few rivers. There are numerous tributaries flowing south from the Himalaya through the Middle Hills, forming the visual 'candelabra' effect so familiar today, thanks to aero-photography. 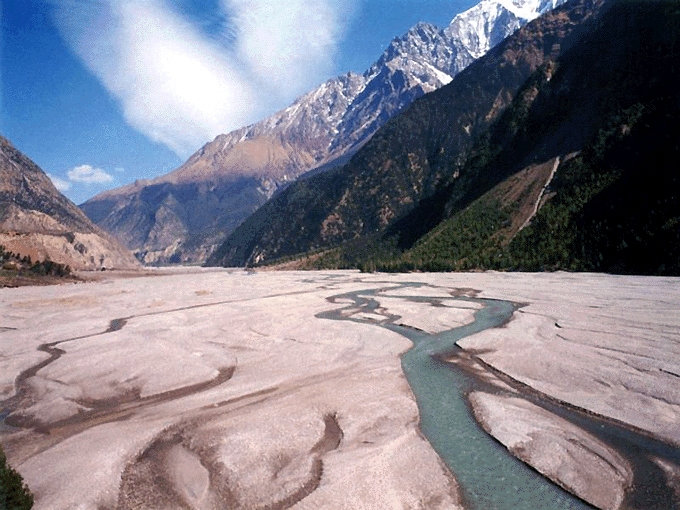 These tributaries gather together just north of the Mahabharata Range and cut through in major gorges, such as the Karnali in the west, the Gandaki or Narayani in central Nepal, and the Kosi in the east. From atop the Mahabharata Range, on a clear day the panorama offers an extraordinary view of the entire Nepal Himalayas, from Mount Everest in the east, all the way to the Annapurnas in the west. The above illustration shows a section of the eastern Himalayas, the eastern part of Rolwaling Himal on the left and the Khumbu Himal on the right. Mt. Everest is clearly visible just to the right of centre. The picture below shows the central Himalayas as observed from the top of the Mahabharat ridge. The Dhaulagiri and Annapurna Himal is on the left, the Himalchuli-Manaslu Himal is on the right. These mountains are between 200 to 300 kilometers distant from where the pictures were taken, yet they are clearly identifiable. With temperatures persisting around forty degrees celsius in the plains of India from April until the onset of the summer monsoon in June, but ten to fifteen degrees cooler atop the Mahabharata Range, Hill Stations were developed as alternate capitals and resorts for the hot season by India's Mughal and British rulers. There are no hill stations per se in Nepal, Sikkim or Bhutan since the capital cities are high enough to avoid extreme heat. Likewise, there are none of the hill station temples to be found in Nepal, like we find in adjacent Indian states. There is a great difference between the northern and the southern regions of the Mahabharata Range. For example, while the northern Mahabharata has a great abundance of citrus fruit orchards, virtually no fruit trees can be found throughout the southern part of the region. This is attributed to the difficult access to the southern portion of the range, resulting in an historical pattern of limited traffic, and in modern times neglect by city planners, for the same reason.